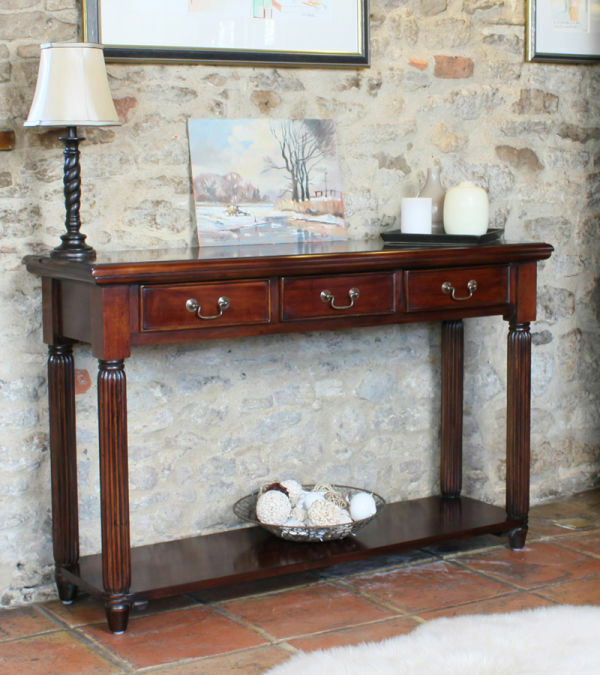 Add a touch of class to your hallway, living or dining room with an elegant console table. They're one of those handy pieces of furniture that can be used in a myriad of different ways. Stylish and practical, they're the perfect place to display objects or store every day items without taking up too much space. 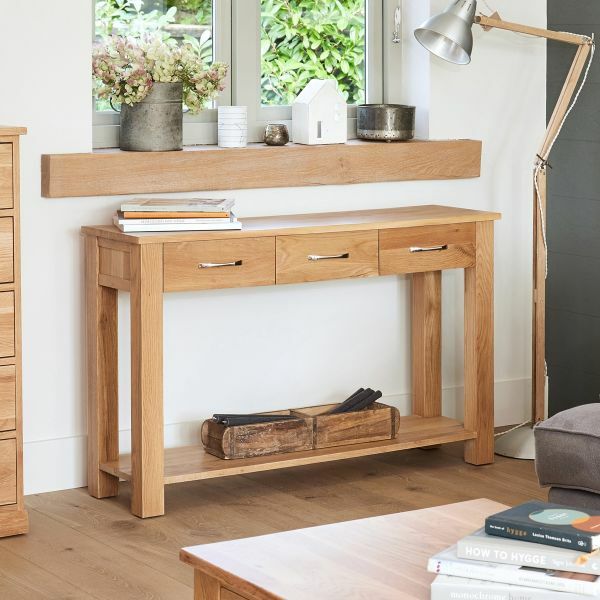 Our collections at The Wooden Furniture Store include a variety of sizes and shapes, choose from classic, contemporary and vintage style designs that come in a choice of timbers with different finishes to suit your taste and the style of your home. 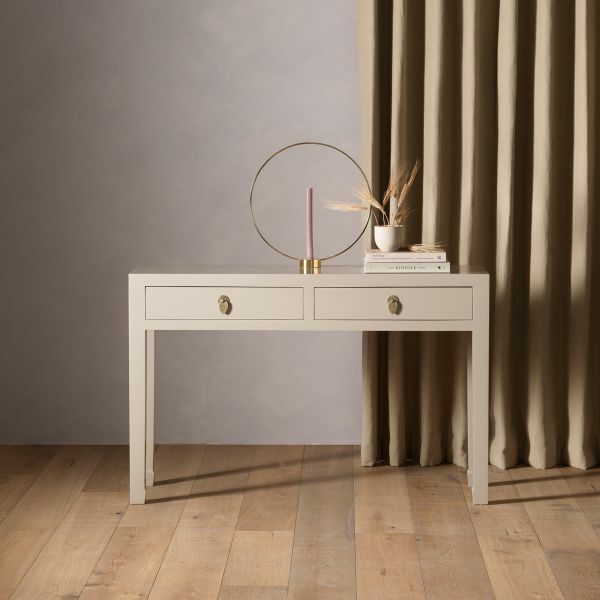 Our selection of console tables are part of wider collections with many matching pieces including shoe cupboards, coat racks and mirrors which make it easy to achieve a coordinated look. 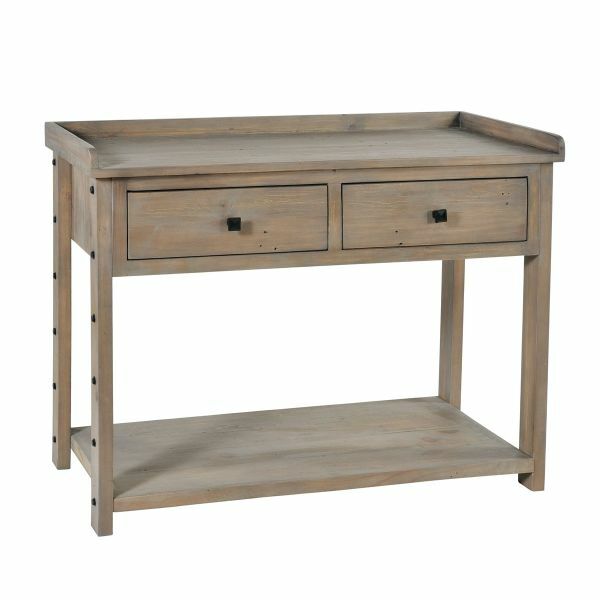 Console tables are versatile and can be used anywhere in the home. 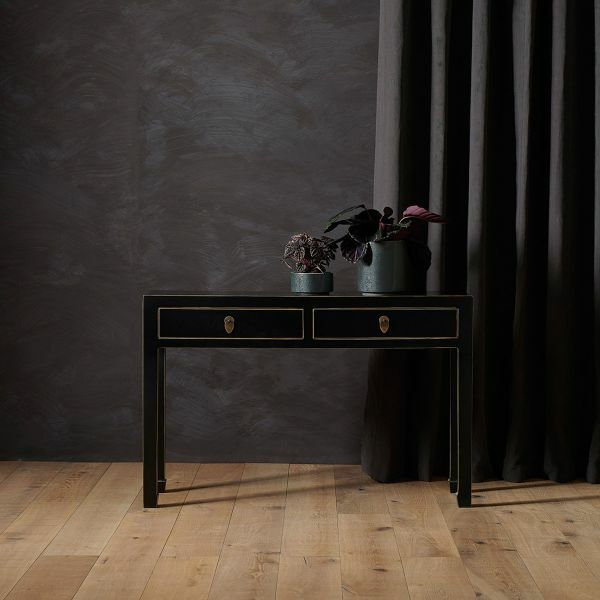 Dark wood console tables can make a real statement in the hallway, as they are the perfect size and provide a decorative focal point for the space. While console tables do usually have one or two small drawers (and many come with a handy shelf at the base), their primary purpose is for display. Console tables have a flat surface which is perfect for showing off the individual items that make your home unique, and can be easily used to give your hallway a warm welcome by simply adding a few favourite ornaments and a vase of flowers. 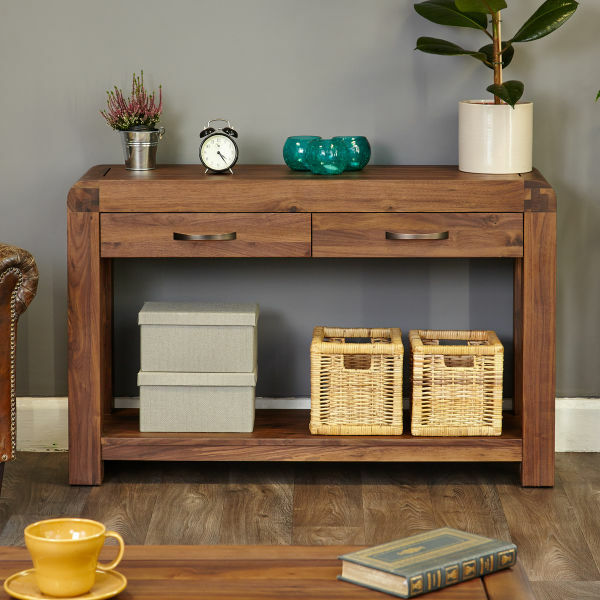 They are a useful place for storing house keys and the perfect spot to leave the daily post, but it's not just for the hallway; console tables work well in the living room and because of their narrow design, they fit perfectly behind a sofa . 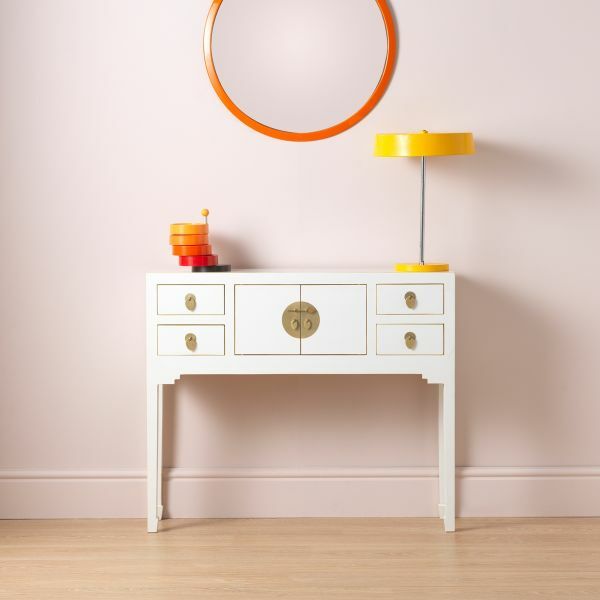 Upstairs in the bedroom, light oak console tables can make a useful dressing table - all you have to do is hang a mirror above it. Or how about using one in the dining room for some extra display space? At The Wooden Furniture Store, choose from our ranges of carefully crafted, elegant console tables in a variety of wood types. 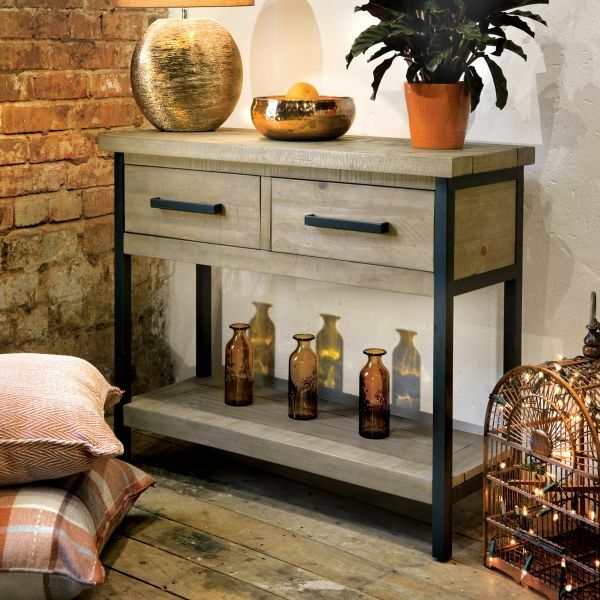 Why not choose one of our rustic oak console tables which will enhance the warm and cosy feel to your home, making it an ideal option to sit in your hallway? 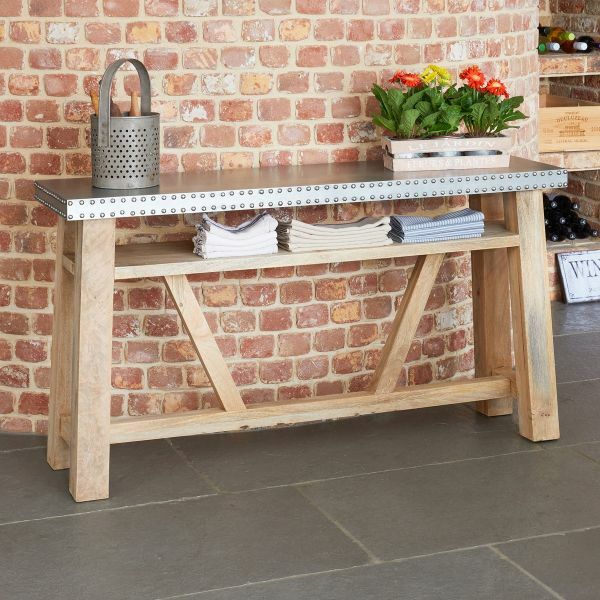 For a contemporary industrial look, browse our collection of reclaimed timber console tables made using recycled wood sourced from Southern India. 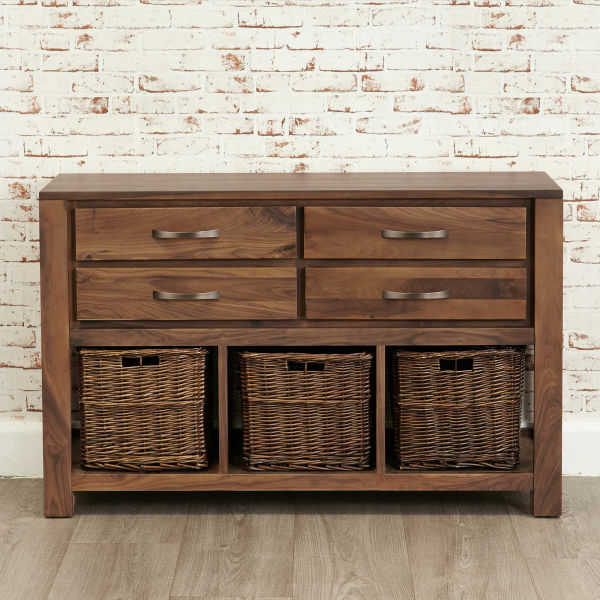 These striking items of furniture have a steel outer frame which highlights the individual colour and character of the reclaimed timber that’s been used. 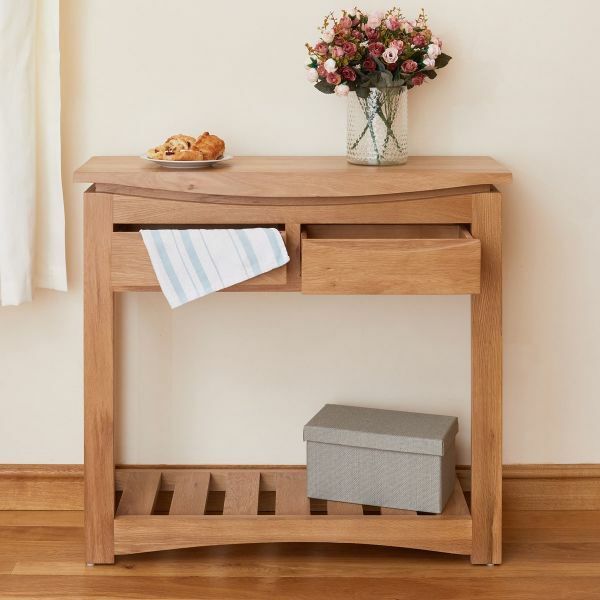 Our walnut console tables will enhance any hallway with their beautiful rich colour and dense natural grain markings. 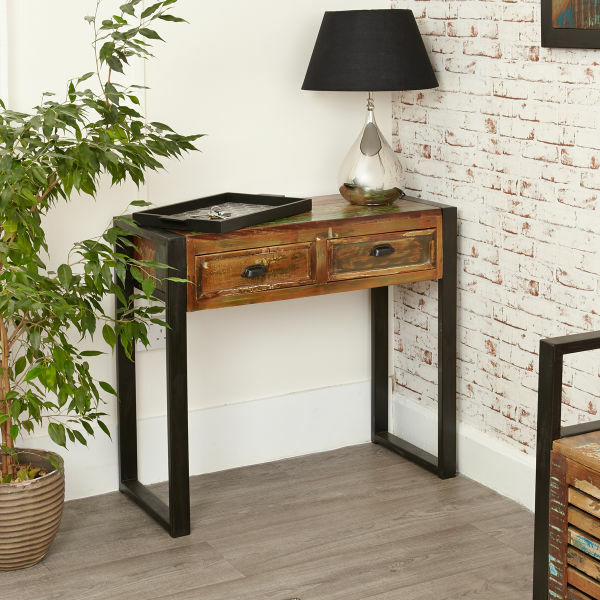 Painted lacquer console tables instantly revitalise your interior design while our painted wood range creates a homely atmosphere. Brimming with character, each of our console tables are practical as well as stylish and blend in with the latest trends in interior design. Our stunning console tables don’t just boast good looks, their quality that will last through the years, too. Carefully built using traditional techniques and hand finished using hard wearing lacquer to reveal the beauty of the natural wood. 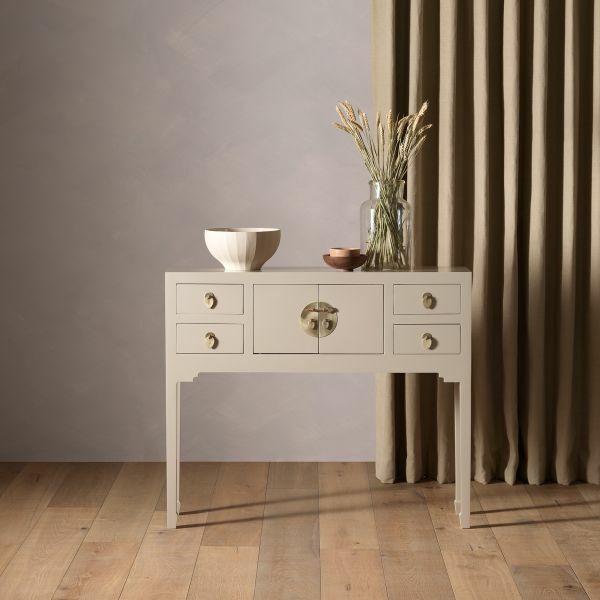 Drawers feature dovetail joints for strength and durability and each console table is finished with elegant fittings for that final touch. Every item is delivered fully assembled, direct to your door by our considerate delivery teams. So whatever your space, any item purchased from the Wooden Furniture Store is an investment for years to come; all of our furniture is of the highest quality, with many ranges guaranteed for five years.